So we’re a little late to the party today. We have still been struggling to get back to mischief while being super busy taking care of family business. Surprisingly, we have managed to still grab a pretty bit piece of the pie. The biggest news is on a personal note. It is official – I put in notice at my job! I won’t go into the boring details of why but I will say that it was imperative to be able to take care of myself and my family. This move has already started opening me up to some great opportunities. May is going to be all about getting my Grandpa’s house on the market but I am also going to start managing a Facebook Page for a local pet store. 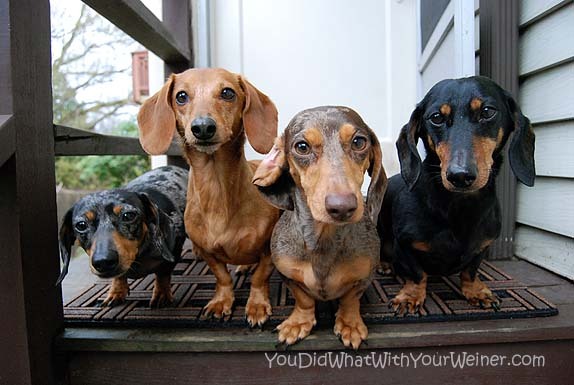 I am also starting a dog walking business catering to Dachshunds and other small dogs. I am still in the planning stages for those so I can’t share any details yet but I will be sure to fill you in as soon as I can. Last week I told you about the BlogPaws and PetSmart contest. We made it to the final round so the last couple of days I have scrambled to shoot a 2-minute video on why I should win and upload it for judging. I want to show you the video but I am not sure I can until the winner is chosen. Stay tuned. 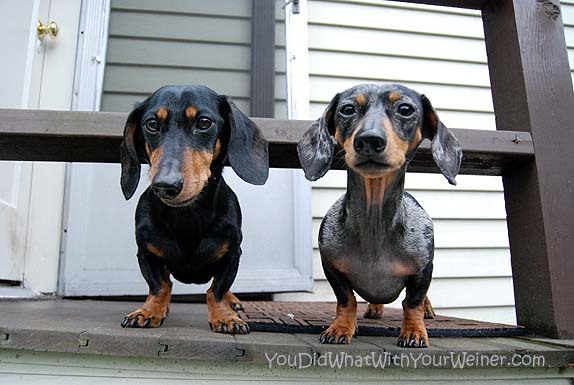 In addition to all of this, we have been weiner sitting two Doxies the last week. We met Serena and Karli with their dog Moms at the last Adventureweiner Walk. Serena is a black and tan dabble and Karli is a light solid red. This was a trial period of a few days. We are going to watch them over a week in a Month or so. These little girls are super cute and were a pleasure to have at our house. They don’t always get to sleep in their Mamma’s bed so they were a little confused the first night. There was a lot of up and down and bouncing around on the bed like at a kids slumber party. Karli is a real face licker too so they would just calm down, we would just start to dose off and then you would get a big, wet doxie tongue in the eyeball. She is fast with her licks too…Like “ratta-tat-tat”. They caught on really fast. The second night all we had to do was lift the blankets and they ran in and laid right down. Serena, Karli and Gretel would all curl up between my legs or by my feet. Occasionally one of them would come up for air because it would get super hot down there. Serena was super sweet but every day when I would come home from work I think she has forgotten who I was. She would run up to me barking, try to run away if I tried to pet her (still barking) and then follow me around barking like she was trying to tell me to leave. After a couple of minutes she would calm down though and get all snuggly. Even though we haven’t made it out into the woods lately we have still managed to do some fun, adventurous things. I DO look forward to nicer spring weather and more available time to hike though. How exciting, all the changes sound wonderful. The best thing I ever did was quit the day job. It’s been a year and I love it. The dog walking and sounds awesome, and I’m sure other great things will come your way. Good luck with the contest. Yay – lots of exciting things coming up for you – so happy !! That last shot is just adorable! I love it! I’m glad things are going well for you. Big life changes, even when they’re for the better, are scary at first! I’m glad you’re jumping in and going after what you want. Good luck with the contest, too! Exciting! 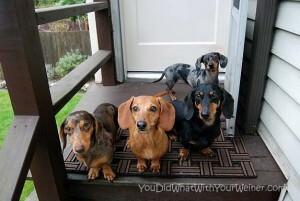 Now you see what our everyday life with 4 doxies is like! Sounds like some exciting transitions happening in your life. We’ll be back to listen and keeping paws crossed all goes smoothly for you. I adore that last picture. What a cute little group. they’re all so bright eyed and shiny. 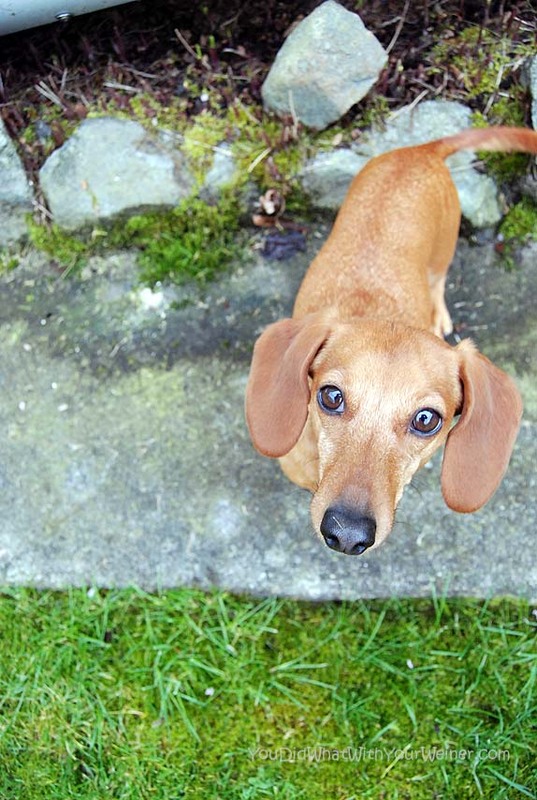 The more I read your blog the more I fall in love with daschunds. Such personality for such a small size! Wow lots of exciting changes happening! We wish you all the best in your new adventures, and really hope that you get that spot for Blog Paws!!! Looks like fun! And I was just talking about the whether ‘Two is Better Than One’, but you’re way ahead at four! Great pictures. I love the last one with all 4 just looking at you while you take the picture. It sounds like you have alot of big and exciting new adventures for yourself coming up. Best of luck to you. And good luck with the contest. Can’t wait to find out what happens next. Wonderful pictures! We wish you the best of luck with your new career and with the contest! Mom loves the name of your blog! Good luck with your new career(s)! Adorable! I see what you mean about Serena looking like Eleanor! They are so cute. Congrats on all the life decisions, I wish you the best! Sounds like a lot of changes for you. Best of luck! Thanks. I know it will all work out in the end. Cool! Those photos was just gorgeous. Look at those body’s, those feet paws, they seem so very healthy. There’s a lot fun coming. I guess! I enjoy looking @ all the pups pics! They are so adorable!!! I have only 2 weenies left of 9 once upon a time. We have adopted a walker hound, 2 chiweenies and 2 beagle/feist mix. Everyone of them know they are loved <3. Each has his own special personality and they are all so much fun and gives us plenty of laughter.